View-Master into the Labyrinth is a really interesting virtual reality game and concept from Mattel. It's a two player game where one player, the Traveler, is walking round a virtual reality maze and the other has a set of physical resources that help solve puzzles that the Traveler encounters. They must work together to escape the labyrinth. Note that to play View-Master into the Labyrinth you'll need a VR-headset such as the View-Master VR Headset or VR Deluxe Headset and a Google cardboard compatible phone. We used an HTC One M7. Into the Labyrinth is designed to work with a View-Master VR headset. The game works with the original headset or the new deluxe model. The new model has immersive sound which isn't particularly useful for this game as you need to be able to converse with the Guide when playing the game. The field of vision is also wider. The new Deluxe VR viewer also has adjustable lenses which will be very useful for anyone who wears glasses. I wear glasses and have to take them off to use the headset and it's too small and you can't get close enough for an optimised view. The deluxe version definitely makes sense if anyone in your family wears glasses or you want visitors who wear glasses to be able to have a go. 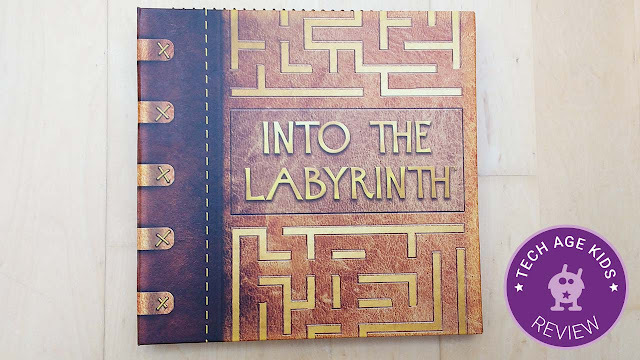 View-Master into the Labyrinth comes as a fold-out hardback book which is designed to look ancient and mysterious. On the whole this is really nicely designed but some of the parts are a bit flimsy and not particularly high quality - the blue film on our glasses doesn't actually cover the hole. Everything does go back into the book for storage although we found the problem solving booklet is fiddly to get back in. First you'll need the free Into the Labyrinth app by Mattel for iOS or Android. We used an HTC One M7 which my son uses to play Pokemon Go, it doesn't have a SIM and there's a problem with the camera which is why my son gets to use it! It has a gyroscope though which is important for Google Cardboard VR. It's worth going through the optional setup process which involves choosing setup in the app and scanning a QR code inside the View-Master headset. (This was a bit of a challenge for us as the camera is broken on the phone and turns everything pink! A bright light did the trick.) The VR experience seemed smoother after we did this, though it worked before. Honestly we spent a while being a bit baffled about what was going on and what we were supposed to do. The instructions aren't very specific and there's no walkthrough to teach you the basics, you just get thrown into a maze and have to figure it out. For the first hour we felt like we were trying to figure out what we were doing rather than actually solving the puzzles in the game. It wasn't a bad experience but I can imagine some younger kids would get a bit impatient while an adult was trying to figure it out. Since we've oriented ourselves in the game we have had a fantastic time. In each game one player is the Traveler and wears the VR headset and must move around the maze telling the Guide what they see. The Guide must interpret what the Traveler tells them and solve puzzles so that the Traveler can progress. Don't expect high quality graphics, that's not where VR on a phone is right now, but the feeling of being in a the physical space of a maze is very effective. The Traveler also needs to solve puzzles that are placed around the maze, the number of puzzles depends on the level of difficulty you choose. 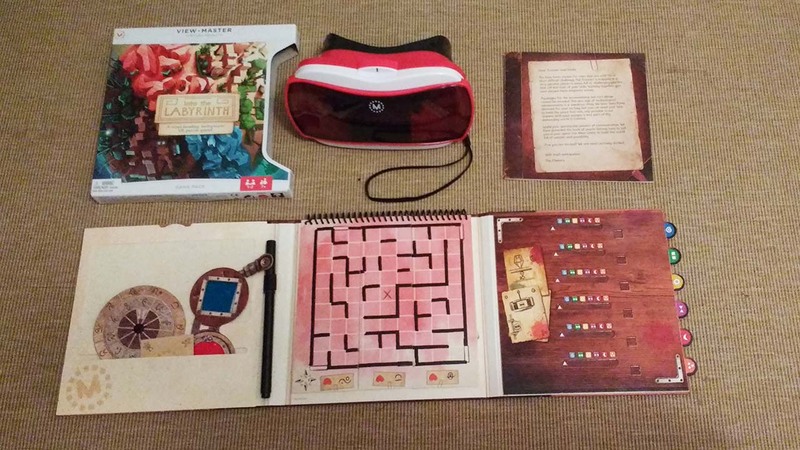 In each puzzle, the Traveler describes what they see and the Guide uses the book, booklet and included tools to solve the puzzle and give instructions to the Traveler. Once you've understood the concepts you can solve an easy maze in a few minutes. As you progress you can choose harder levels and will need to solve different kinds of puzzle. The first time you encounter a puzzle you have to figure out the puzzle mechanics, but the details of the puzzle are different every time so there's plenty of replayability. The puzzles are all classic code-breaking, adventure puzzle style things with a nicely mysterious twist. As things get harder you can write down notes on the wipe-clean map and note area with the included pen. I really liked that you have to describe visual symbols to each other. My 10 year old found this really hard at first, but it felt like a really useful thing to do. After a while we developed our own shorthand vocabulary for the symbols like 'the ear' and 'face with a twirly moustache', this was lots of fun! I've played the game with each of my children, aged 8 and 10, and we took turns in the two roles which means that no one uses the VR headset for an extended amount of time. This works really well. As a parent there are some things you play with your kids because it makes them happy, it's always nice to find things that you enjoy as much as them (or possibly a little bit more!) 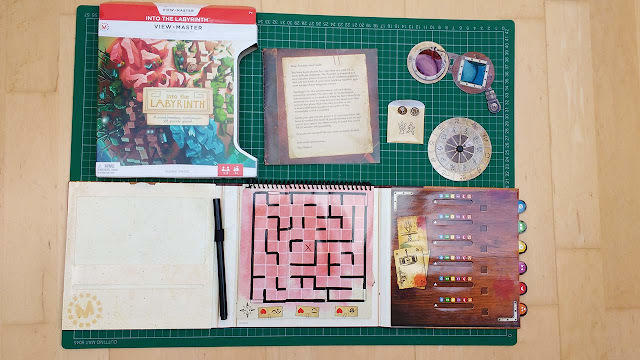 Into the Labyrinth is a game that I'm more than happy to play with my kids. It's a really nice way to spend time together. Into the Labyrinth reminds me of The Adventure Game (some episodes recently re-released by the BBC, yes kids have been made to watch them :) and The Crystal Maze TV programs which I watched as a child, but this time we actually get to participate. View-Master into the Labyrinth is a fantastic way for a parent and child, siblings or friends to spend some quality time together in a way that's engaging and develops useful skills. It's important to understand that you do need to put some effort into understanding the game and that you should see it as an edutainment activity, something that develops useful STEM skills and requires some thinking rather than something that's pure fun. It's great for developing logical and analytical thinking, collaboration and communication skills and spatial awareness. I'm sure our children's children will laugh when they realise that this is what they had for a VR experience when they were kids, but it's pretty cool to be in at the start of something. Mattel have really tried to do something interesting with VR for kids and it definitely feels worth the RRP of $19.99 to us to be part of that. Interesting article. 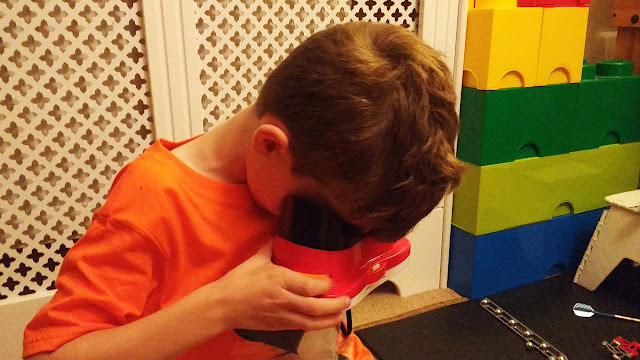 Our son got a VR headset for his birthday. Initially it was greeted with a WOW as it seemed such a cutting edge present, but we've yet to find an app that fulfils expectations. I know it's emerging technology so we're watching this space, but if you come across any other games like this I would be interested to hear. What age range would you say this is best suited to please? Thanks.